The float valve and column section design give excellent vapor liquid contact without hold-up problems. Each section is approximately 50 mm long and has a floating ball valve. 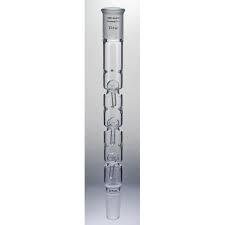 The column has a top outer and bottom inner ground glass joint of the same size.